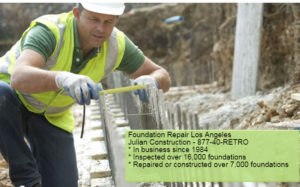 LOS ANGELES, CA: Julian Construction Inc. (www.julianconstruction.com) celebrates their 13th anniversary this year in the foundation repair and foundation construction business. On this occasion they take a moment to look at their company objectives in these past years. Throughout the last 13 years Julian Construction has had as its basic focus the repair and construction of home foundations. Julian De La Torre, founder of the company, began doing earthquake retrofitting in the days before the Northridge earthquake of 1994, and his goal is to ensure that L.A. area homeowners and commercial property owners are prepared in the event of future earthquake strikes. His partner, Shawn Kyles, has inspected over 16,500 structures over the course of his career. Another of Julian’s objective is for their clients to not have to deal with a middle man, salesmen, or subcontractors. Their intention is that property owners can work directly with their company and thus can get the foundation services they need at an affordable price.